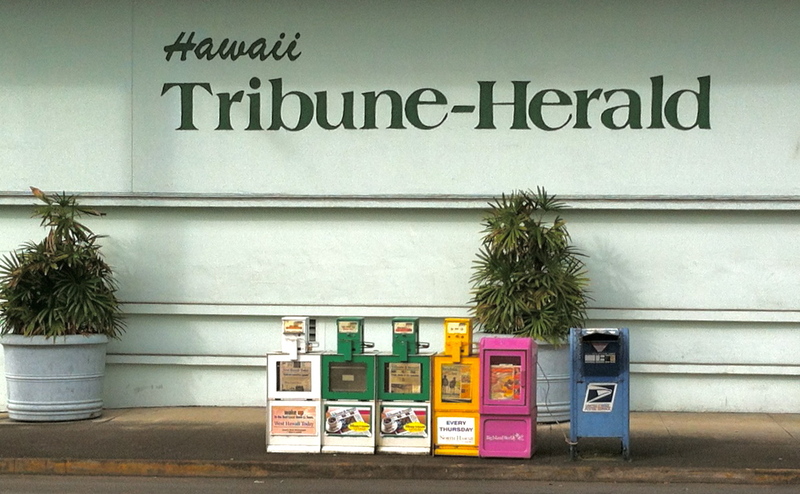 Negotiations between the Hawaii Tribune-Herald bargaining committee and the company this week produced an offer from the company for a one-year extension of the collective bargaining agreement with some significant modifications. The guild has taken the company’s offer under advisement and will discuss the terms with members over the next week. Subcontracting: The company would have the right to subcontract 10 jobs in the mailroom and 4.5 jobs in ad production/operations, which would trigger layoffs as soon as 60 days after an extension is signed. The company indicated that it intended to keep 3 part-time jobs in the mailroom at a combined 50 hours per week and 1 full-time job in ad production/operations. The layoffs would not be based on seniority. Workers would be selected based on work record, qualifications, the ability to do the remaining work, and length of service. Severance: Full-time employees in the mailroom and ad production/operations would be paid severance under the terms of Section 15 of the existing contract, which is one week of pay for every year of service up to 30 years. Part-time workers, who do not have severance under the existing contract, would receive severance payments of $2,000. Health insurance: The company will pay health insurance premiums — or the cash equivalent — for laid off workers under COBRA for six months. Life insurance: The company will pay the current life insurance premium for laid off workers for six months. Sick leave: Workers who are laid off would be paid in cash for unused sick leave days. Education and retraining: Workers who are laid off would be eligible for reimbursement of up to $500 per semester for two semesters of job training. Signing bonus: All full-time guild members would receive a $750 signing bonus and part-timers would be paid a $300 bonus. Medical savings: The company will establish a premium-only plan that will allow workers to pay health insurance premiums on a pre-tax basis. Electronic devices: The company will provide a $20-a-month stipend for workers who are asked to use personally owned electronic devices, such as a smart phone or tablet, for work purposes. We are the Pacific Media Workers Guild, Local 39521 of The Newspaper Guild-Communications Workers of America. We represent more than 1,200 journalists and other media workers, interpreters, translators, union staffs and freelancers.